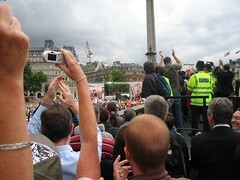 A year ago a colleague and I wandered down to Trafalgar Square to watch the announcement about who would host the 2012 Olympics. The place was packed and had been filling up for hours. As the announcer stated London the place erupted with cheers and claps and then got filled with tickertape. London was up for a celebration and the papers the next day were filled with quotes and stories about how the Olympics would make a difference, how much everyone was looking forward to it. Forget the politics, the money issues, delays or any of the thigns that could go wrong, it was a week to look forward. The events that next day stopped that feeling in its tracks.